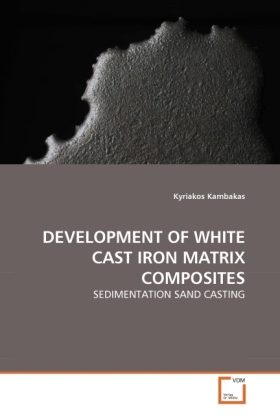 In the work that is described in this book we studied a new cast iron based composite material that was produced by a double casting technique using sedimentation sand casting. The material is based on high Cr white cast iron reinforced with WC particles. A sand casting method was developed during which the WC particles were directed to a specific location in the ingot and were distributed uniformly in the near surface area of the composite during casting/solidification. Two new approaches have been studied; in the first the WC particles travel through the iron melt and settle at the bottom of the mould and in the second WC particles settled at the bottom of the mould experience the forces of the liquid flow. The solidification paths of the three WCI matrixes and MMCs have been simulated with the Scheil-Gulliver model using the Thermo-Calc software for different iron based alloy systems. The wear of the new materials was evaluated both in an industrial scale and in the laboratory (pin-on-disc). The results showed an improvement in the wear life of the component of several times compared to the standard high Cr WCI material used by the same industry to date.